After trying a few schemes I have settled on a MAX9814 circuit for the AGC. I used the Adafruit board but there are a few variations on eBay with some probably requiring less hacking than the Adafruit design. I had to solder a wire on a SMD component to access the CT (time constant capacitor) pin of the MAX IC, and remove the Electret capsule. I have attached the schematic and a few pictures of the AGC circuit as I now have in the rig. The 5VDC is taken from the Raduino board. Performance wise I took two sets of measures, one with the AGC turned down low and one with the AGC turned one third of the way up. A few notes on the tests. I used an A/B comparison with an FT-817, with the pre-amp off, receiving a carrier at 1,500Hz from local radio stations (with attenuation). The FT-817 S-Meter seem notoriously non-constant in the steps between the S-units, but that is all the reference I have where I am. 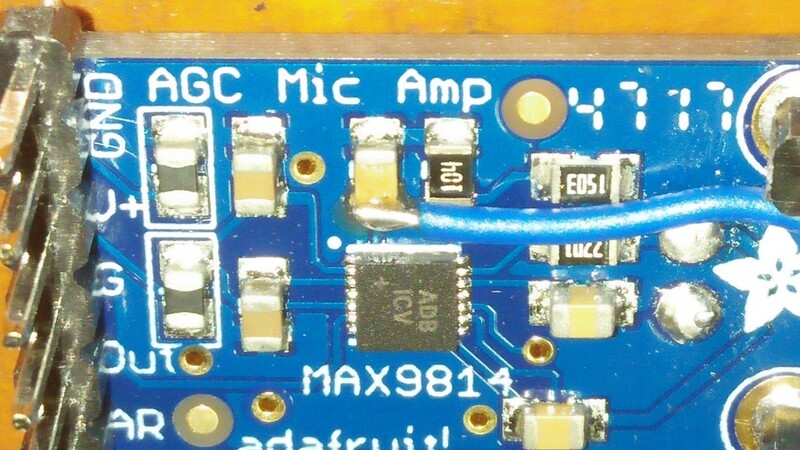 The AGC voltage is taken from the CT pin of the MAX9814. The AGC voltage fluctuates quite a lot, so I tried to record the average value. 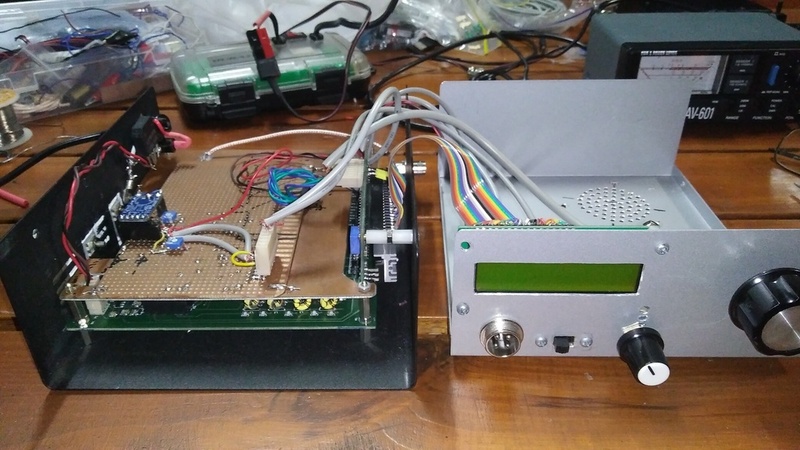 At high signal strength, to determine if the saturation was coming from the AGC circuit or the uBitx upstream, I would bypass the AGC and keep the volume down to prevent the audio circuit past the volume pot from saturating. If the harmonics of the audio disappeared, the AGC alone was producing distortion, otherwise it appeared at least before the AGC, and possibly in as well. 1. "Medium" AGC: input pot turned to about 30% of full scale. S8 1,700 Large variation. FT-817 S-meter S8 plateau issue? S9+10 2,460 Saturation of AGC audible, but not unplesant. S9+20 2,460 Audible saturation of both uBitx and AGC (harsh sound). The AGC kicks in early and keeps the volume pretty constant until saturation occurs. Saturation of AGC does limits the dynamic range of receiver. 1. "Low" AGC: input pot turned to about 7-10% of full scale. S9+30 2,400 Audible saturation of uBitx and mostly of AGC. This is the most "FT-817 AGC" like, from my perspective, and is what I have settled for. I want to use the AGC voltage as an s-meter input and this setting does produce a gap at the bottom end, but this is not critical IMO. In both cases I noted some small "clicks" when the AGC kicked in on strong sudden signals. 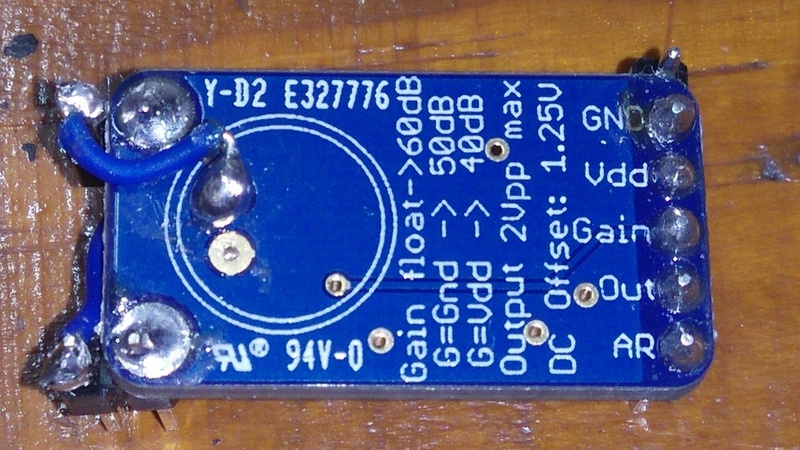 The maximum gain of the MAX9814 as set in the schematic attached is of 50dB and requires screened cables in the audio circuit. 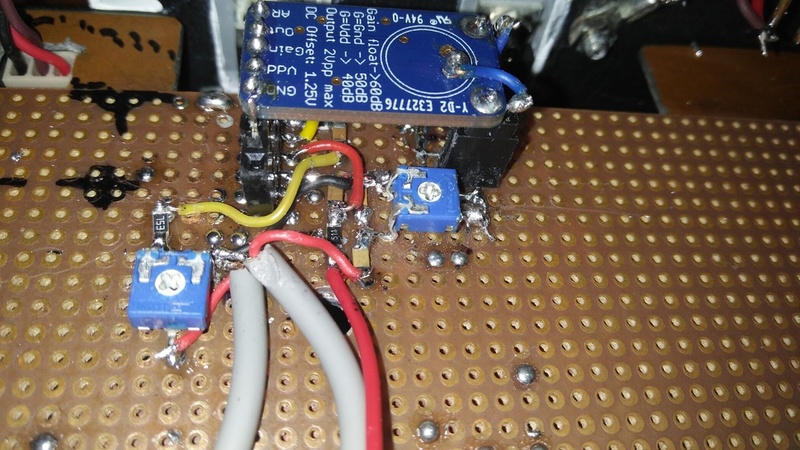 I originally had the input and output of the circuit fed to a two core "stereo" screened cable and I would get feedback. I had to use two single screened audio cables.